applied to domestic cleaners. He produced 5,127 prototypes of his ‘cyclone’ cleaner before it finally went into production. The bright and synthetic colours of the units show that the product is not meant to be placed out of sight in a cupboard. It is to be regarded as an attractive object as well as being functional. One of James Dyson's earlier successes was the invention of the 'Ballbarrow' the design giving greater mobility in turning and greater stability on softer ground. engineering principles involved required significant patent protection - and yet this protection has to - and did in Dyson's case - be funded from a business income that ( in many similar cases too) - has not yet begun to grow. 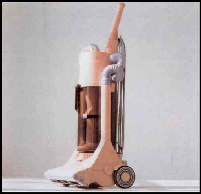 Patents require continuous renewing to afford full protection and it wasn't too long before rival cleaner companies copied the design principles requiring the Dyson company to protect the engineering principles in court.